The first dogs of North America arrived alongside humans and were not domesticated from North American wolves, but rather, from a Siberian ancestor, a new report says. These ancient lineages, the first to set tamed paws in North America, have all but vanished – largely after the arrival of Europeans. "Why dogs survived and thrived for thousands of years in the Americas only to swiftly and almost completely disappear with the arrival of Europeans, remains a mystery," write Linda Goodman and Elinor Karlsson in a related Perspective. Domestic dogs first appear in the American archaeological record 9,900 years ago – nearly 6,000 years after the earliest evidence of human activity. However, the precise timing of their arrival, as well as their associated geographic origins, are not well understood. Here, Máire Ní Leathlobhair et al. combined archaeology with genomic analysis to investigate in unprecedented detail the origins of these so-called "pre-contact" American dogs – or, domesticated dogs that populated the Americas prior to the 15th century arrival of Europeans. The researchers' comprehensive analysis involved both modern and ancient dog DNA, including DNA recovered from archaeological remains from North America and Siberia. They found that pre-contact dogs stem from a genetically distinct clade, most closely related to a 9,000-year-old ancient breed of sled dogs from Eastern Siberia. And, ancient American dogs were not domesticated on the North American continent from native species, but rather, were introduced into the region by way of Beringia a few thousand years after the very first settlers arrived – closely supporting archaeological evidence. Today, these dogs and their genetic trace have all but vanished, possibly because European colonists discouraged their sale and breeding, the authors of the related Perspective speculate. Though, Ní Leathlobhair and colleagues do claim to have identified what could be these animals' sole surviving legacy – a globally distributed canine transmissible venereal tumor. In their related Perspective, Goodman and Karlsson highlight the power genomic technology has in bringing these forgotten narratives to life, even despite its limitations. "The story of the pre-contact American dog is just starting to be told," these authors write. In another genomic study of ancient animals, Kevin Daly et al. 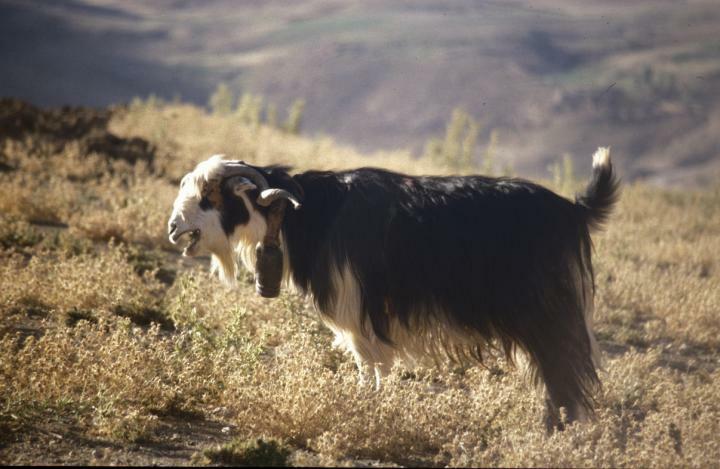 demonstrate that the domestication process of goats in the Fertile Crescent was dispersed, involving several ancient wild goat sources, which resulted in numerous genetically and geographically distinct Neolithic goat populations in the Near East. The study also provides evidence for selective breeding for beneficial traits, including color. Current data suggests that goat domestication occurred in the Fertile Crescent around 8,000 to 9,000 years ago, but evidence as to how this process occurred is inconclusive. To determine whether this initial domestication occurred as a single event which then spread throughout the Far East, or in multiple areas with different populations of goats, Daly et al. analyzed genetic data from ancient goat specimens from Paleolithic through Medieval contexts throughout the Near East. Within the samples from the Neolithic period, the authors discovered domesticated goat subgroups that were genetically distinct from one another, and geographically focused with distributions located in the western, eastern and southern regions of the Fertile Crescent. In later post-Neolithic samples, this pattern changes, the authors report, with less divergent. According to the authors, similar genetically divergent patterns are echoed in the geography of other early domesticates, like pigs and cattle, as well as their ancient human domesticators. Daly et al. 's findings suggest the sharing of knowledge between separate groups of people, which led to parallel lines of animal domestication and multiple routes of dispersal out of the Near East, rather than large-scale population migrations across Southwest Asia. The authors also identified what could be 8,000-year-old evidence of selection for positive domestic traits, including color. The pigmentation gene KIT, involved in the piebald coloration trait, was shared between the Neolithic goat populations, the authors say. Accordingly, just like in modern goats, preferential selection for color may have been used to distinguish animals or for aesthetic value.